Unfortunately my copy of the Dripps 1852 Queens map does not run all the way to the East River; however, it does show quite a bit of what eventually became Long Island City and Astoria. The map does show an established street grid in western Astoria and in Astoria Village, the area along the river just south of today’s Astoria Park. 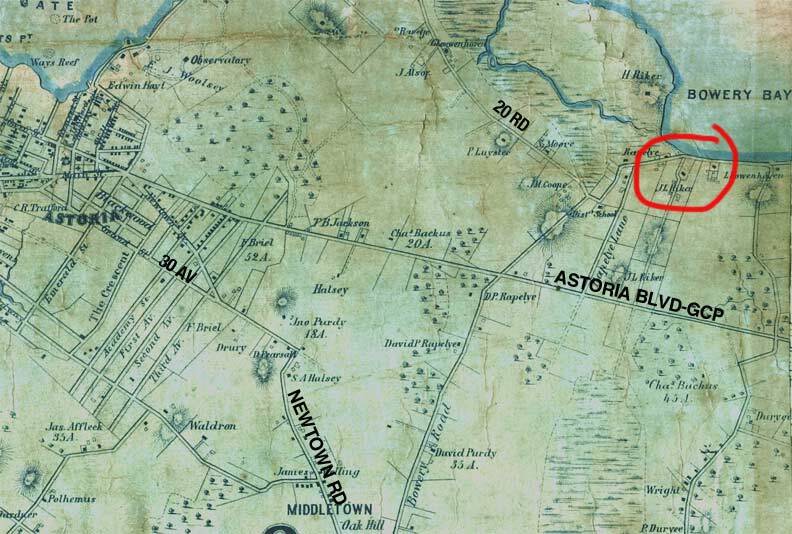 Astoria’s pedigree dates to the mid-1600s, when William Hallett received a grant for the area surrounding what is now Hallett’s Cove by Peter Stuyvesant. However, the oldest structures in the region date to the mid-1800s, after fur merchant Stephen Ailing Halsey had incorporated the village in 1839. Wealthy businessmen built homes on what are now 12th and 14th Street, some cozy boxes, others large, ornate mansions; sadly, those that remain have been altered nearly beyond recognizability because these streets have never been granted status by the Landmarks Preservation Commission and hence, they are slowly disappearing. Much of the structure and street plan of Halsey’s village can be seen on the 1852 map and that original plan, still in existence, has radiated south and east. Newtown Avenue and Newtown Road were once a continuous road, with the center section lengthened west and east to become Grand Avenue, eventually 30th Avenue. “The Crescent,” — its bend likely got around a hill — is still called Crescent Street and was never given a number. Astoria Boulevard began as a plank road to Flushing, and was originally named Flushing Avenue. By 1920 it had become Astoria Boulevard, and by 1936 it was overlaid by the Grand Central Parkway, the express vehicle connector to the Triboro (RFK) Bridge. The “Bowery Road” on the right side of the map faded from existence after the regular street grid was overlaid, but it was once the main north-south road in Astoria. It began near Newtown Creek and ran north to the East River, splitting in two at that point, with the western portion still in existence as 20th Road in North Astoria. The eastern portion is still a short section of 19th Road, and on it you will find the Lent-Riker House, the oldest building in NYC that is still a private dwelling; I have circled it on the map in red. The amazing thing about the map is that it shows LIC and Astoria as swampy area with intermittently-spaced houses with just a few roads going through. There is no hint of the bustling urban neighborhood that would begin developing there in a few short years. It’s remarkable how little of the area near the Lent Homestead is recognizable from that time. The airport replaced North Beach, Garden Bay Manor replaced much of the area west of the airport. 19th road has a two block piece and a converted alleyway for one block. The Lent house remains with the cemetery. That’s about it. Likewise it is almost impossible to find any remnant or even reminder of North Beach, which was a major area of entertainment for decades. There was a big fire at North Beach and destroyed most of the attractions there. It was torn down after that. Mr. Steinway had a picnic for his workers every summer there. 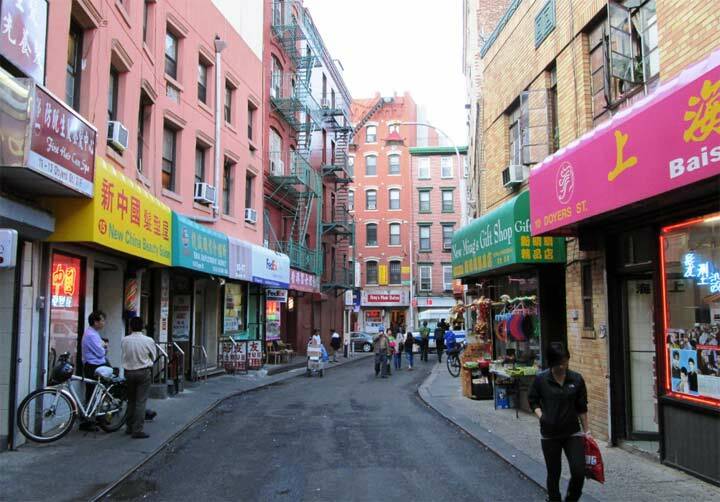 I grew up in Astoria on 44th street between 30th and 31st ave. I miss it so much especially seeing the old photos.